Standing to File an Iowa Personal Injury Lawsuit | Hupy and Abraham, S.C.
Do I have the legal right to file a personal injury lawsuit in Iowa? 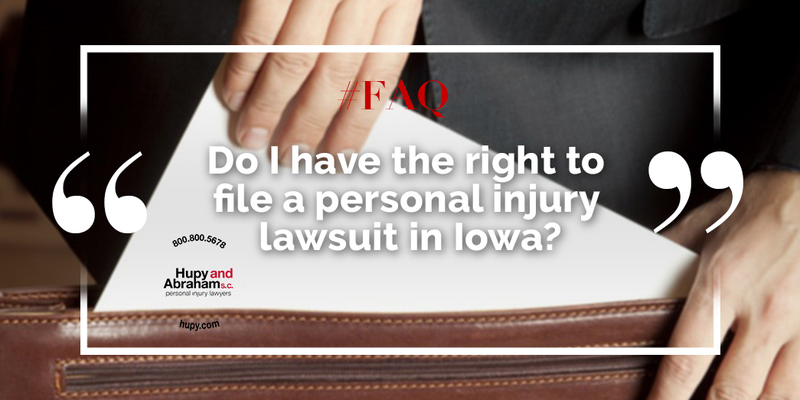 You have the legal right—or standing—to sue after an Iowa personal injury accident if you were the one who suffered an actual injury or if you have a certain legal relationship to someone who suffered an actual injury. The threat of an injury or being scared that an injury will occur because of someone else’s wrongdoing will not allow you to recover damages in court. You were the one who was hurt. If you suffered an injury because of someone else’s negligence, you are 18 or older, and you are of sound mind, then you have standing to file a lawsuit. You are the parent of a minor child who was hurt. A minor child cannot file a lawsuit independently. However, as the child’s parent you have the right to file a personal injury case on behalf of your child. The recovery would be for the benefit of your child. You are the legal guardian of someone who was hurt. The rules here are similar to those of a parent and child. If you have been named by the court as the legal guardian of someone else and that person is injured, then you may have the right to file a case for the benefit of the person who was hurt. You are the personal representative of the estate of someone who died. If you are the personal representative of someone’s estate and that person died in a personal injury accident then you have the right to bring a wrongful death lawsuit on behalf of the estate. Any recovery that is made will belong to the estate. It is important to determine whether or not you have standing before you file a lawsuit. If you do not have standing to sue, then the defendant will raise that issue quickly and your case will be dismissed without your recovering any damages. That is not worth your time and effort. Instead, you want to be sure that you have the standing that you need and that you know how a personal injury case works in Iowa so you can minimize any surprises and protect your fair and just recovery. Please contact us online or call us directly at 800.800.5678.